Mrs.CB in BC: Passport Renewed! We've been here in Pinas since November 8, 2016 and one of my biggest mistakes was not booking a schedule for passport renewal early. I forgot that I had to renew my passport (as it is expiring on November 2017) and only remembered it after Ford has left. I immediately took my laptop and went to the DFA website. Getting an appointment online isn't new to me as I have done it before. However, that particular night, I encountered so many errors that I wasn't able to secure one. Maiyak-iyak na ako talaga. It must be the internet connection, napuputol-putol kasi. 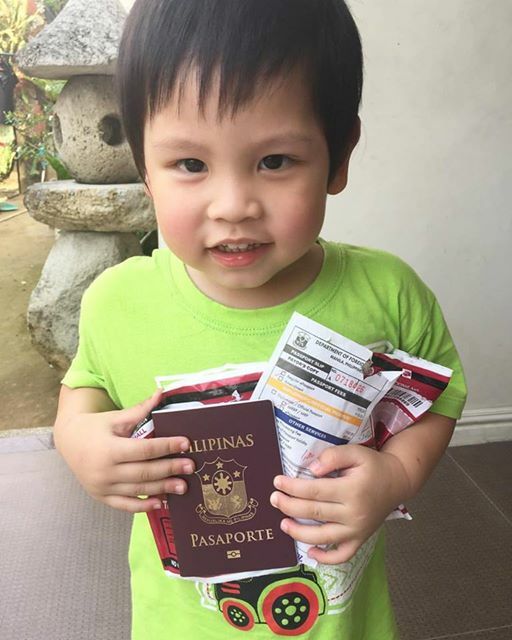 Ang haba ng fini-fill out tapos hindi naman "makakapasok." In every attempt, palayo ng palayo ang date na available. Puro last week ng March na. I tried again the following day and was able to get a March 20 appointment in Marquee Mall. But because our flight back to Canada is on April 16 already, I cancelled it. Alanganin na talaga even if ipa-express ko. Province pa kaya mas matagal. Tapos magho-holy week, baka mabitin pa.
My solution was to walk-in na nga lang in Robinson's San Fernando. The problem though with walk-ins is that you have to be there as early as 3 am to be able to secure a slot. I have no problem with that as I have a car, kaso si Nathan. Ayaw niyang humiwalay sa akin eh, magigising yun at iiyak kapag wala ako. Sobrang kawawa naman kapag isinama ko ng madaling-araw tapos ang tagal pipila. I can still fly back to Canada with my current passport since sa November pa naman ang expiration but I don't want to renew my passport there. Bukod sa mahal, matagal kasi. Ayaw ko ng idea na hindi ako makakalipad anytime. What if may emergency? Wag naman sana. Anyway, I was about to lose hope (haha) when my husband Ford checked again the DFA website. Luckily, he found a February 24 slot. Yun nga lang, sa Robinson's Novaliches. 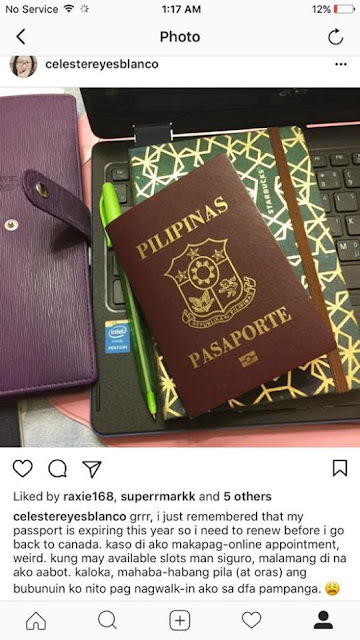 Bago lang yata ang DFA passport renewal center dun kaya hindi pa ganun kadami ang nagre-renew kumpara sa iba. Saka nga hindi strategic. No choice, we had to grab it. Si Ford na ang nagpa-appointment sa akin because he has faster internet. February 24, 2017 (Friday). My appointment was at 1pm but we left the house at around 8:45am to be sure. We didn't have a kasambahay back then so Joanne (our ever loyal secretary) accompanied me and Nathan. We just relied on GPS to get there. Thankfully, we arrived safe and early. We proceeded to DFA and I checked with the staff at the door if my name's on their list of people with appointment. I said my appointment's at 1pm, she said yes and told me I could go back at 12noon. We had 1 1/2 hours to kill so we ate and went around the mall. Luckily, there was a play area for kids where I can leave Nathan and Joanne. Solved na ang problem ko kay Nathan kasi tiyak malilibang siya doon and he wouldn't look for me. I was back at DFA 10 minutes before 12 and they let me in without asking for my appointment time. Grrr, I realized that they are not particular about the time pala! Basta nasa list ang name mo, papapasukin ka na. Tsk, sayang ang oras na nagpalakad-lakad kami. It was a busy day Friday so mas maganda kung makakauwi kami ng maaga kasi may mga trabaho pa si Joanne. Anyway, I was hopeful that I could get it done in less than an hour. The first steps were fast, saglit lang talaga. Kaso sa last step nagtagal -- kung saan ka kukunan ng picture and finger prints. There were only 2 active staff that time, lunch time pa rin kasi. You'll be given a number and you have to wait for it to be called. One hour akong naghintay. By the way, I chose "Express" processing for Php1,200 (regular is Php950). Seven working days daw. Kelangan ko kasing magsigurado kasi nga baka magkaproblema pa eh me flight ako ng April. I had it shipped to me for Php150. After being a bit worried because I was expecting it to arrive sooner, I finally got hold of my new passport last Saturday, March 11. If we start counting from Feb. 27 Monday (because I renewed in the afternoon of Feb. 24 Friday), it took 10 working days before it landed on my lap. I am so happy to have my passport renewed! I just do not like my picture hay. I heard that soon, Philippine passports will have 10 years validity na, which is very good especially for Filipinos living/working abroad. Sayang nga lang hindi na ako umabot. This could be my last Philippine passport as I will be applying for Canadian citizenship once I meet the residency requirement. It'll be a sad day, changing passports. But to be honest, I am excited too. A blue passport is a powerful passport. It will mean mobility. No need to apply for visas and all.